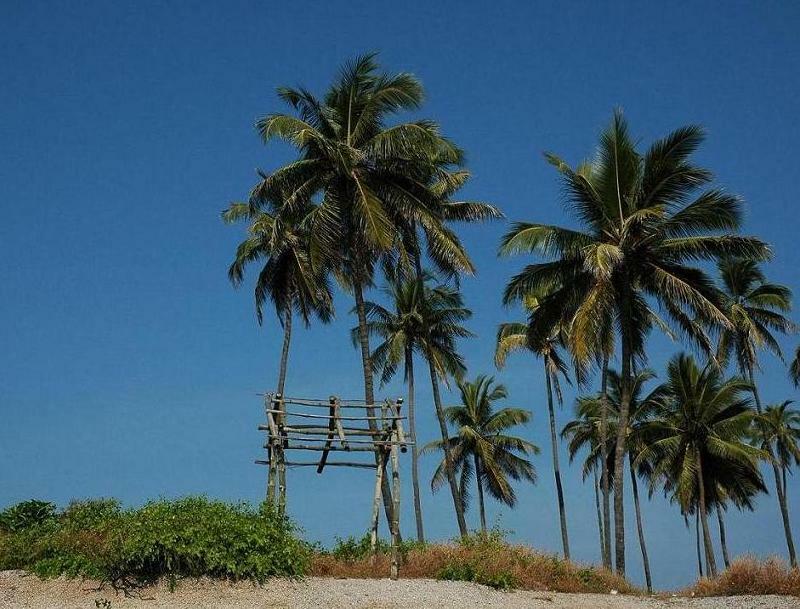 This beach is situated on the Mangalore-Udupi highway (NH 17) to the left around 7 kms from the city. On the way to this beach you can see MCF (Mangalore Chemical Fertilizer) and Kudremukh Iron Ore Company.The Panambur beach is a popular Sunday outing spot among the locals. This beach is very near to the New Mangalore port, it is the harbor for many ships. Usually granites and grains are exported from this harbor. This is a beautiful clean beach attracting large number of visitors and tourists during summer vacation and other holidays. You can also view splendid ships sailing among the ups and down of the rough Arabian sea. Chat and snack stalls are available near the beach. One can see the shoreline stretching of all the way to Surathkal from here. 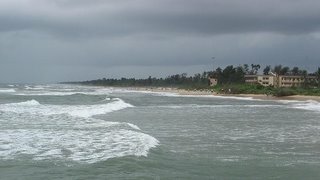 The lighthouse of the Surathkal Beach can also been seen from this beach. City Buses with Route no. 2, 2A, 2C, 40A, 41A, 45, 45G, 53, 53A, 59 A short walk of 10 minutes from the bus stand is required to the beach. To get there take the City Bus No 44, 44D. It is 9 Kms to the south of Mangalore, and 1/2 Km from the Someshwara Bus stand, this beach is well known for the large rocks called “Rudra Shile”. The historical Somanath Temple constructed during the regime of the famous queen “Raani Abbakka Devi is situated in the north side. To get there take the City Bus No 44A from Hampankatta bus stand. This beach is also situated on the Mangalore-Udupi highway (NH 17) to the left around 6 kms from the city. You will come across Kudremukh Iron Ore Company on the way to this beach, from the side walls you can have a look at the Iron Ore company. The special attraction of this beach is the boating facility. Boating is open to public only during summer and during public holidays. You can take a panoramic boat ride through the back waters of the Arabian sea. To get there take the City Bus No 1A from Hampankatta bus stand. Just a boat ride away from St. Mary`s Island around 66 Kilometers from Mangalore.This beach is surrounded by the deep Arabian Sea and it is very beautiful during sun set. Maravanthe lies about 9 km east of Kundapur, along the sea coast. It is an enchanting place, where on the western side, the Arabian sea is stretching, while on the eastern side, runs the Sauparnika river and in between them passes the west coast road with the Kudachadri Hills in the backdrop. 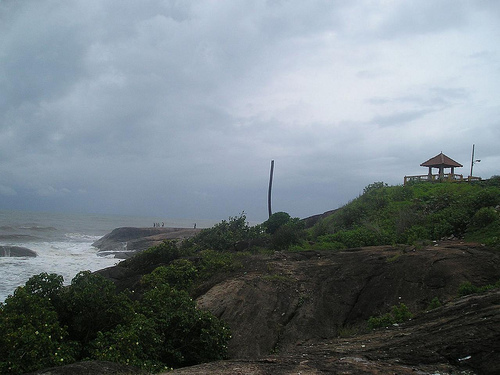 Kaup Beach is located 12 km south of Udupi. It is situated on the coastal belt. 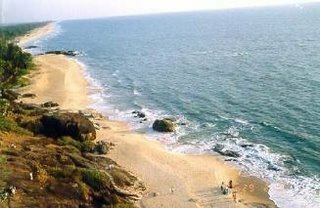 The Kaup beach is one of the most beautiful beaches. Its placement is perfect. The beach with the 100 ft high lighthouse on the rocks is a photographer’s paradise. The beach is a serene place with nature’s beauty in abundance. The sound of the waves caresses the breeze sensuously. A must be visited place for romantic couples. These are the reasons that Kaup Beach is a tourist attraction. A walk along the rambling white sand beach and the cool blue water of the sea renders a remedial result for wore out souls. This entry was posted in Mangalore and tagged Canara Bank, Hampankatta, Jeppu Ferry, Konchady, KREC mangalore, kudremukh, Maheshwar Temple, Mangalore, mangalore city bus, Mangalore-Udupi highway, Nandigudda, NH 17, NITK, panambur beach, raani abbakka devi, Rudra Shile, Sayyed Madani darga, Somanath Temple, someshwara, summer sands, Surathkal, Surathkal Light House, Thanner Bavi Beach, udupi, ullal. Bookmark the permalink.